In the summer of 1666, one of science’s most celebrated legends, Sir Isaac Newton, is said to have seen an apple fall from a tree on his family’s farm at Woolsthorpe Manor. In questioning how the apple’s trajectory sent it straight to the ground, Newton theorized what would be published in 1687 as the theory of gravity. UBC has descendants of those trees right under its nose. Turn up Wesbrook Mall from Marine Drive and you are soon confronted by a roundabout. Turn right and you are on the TRIUMF campus. Go straight and you head into Wesbrook Village. 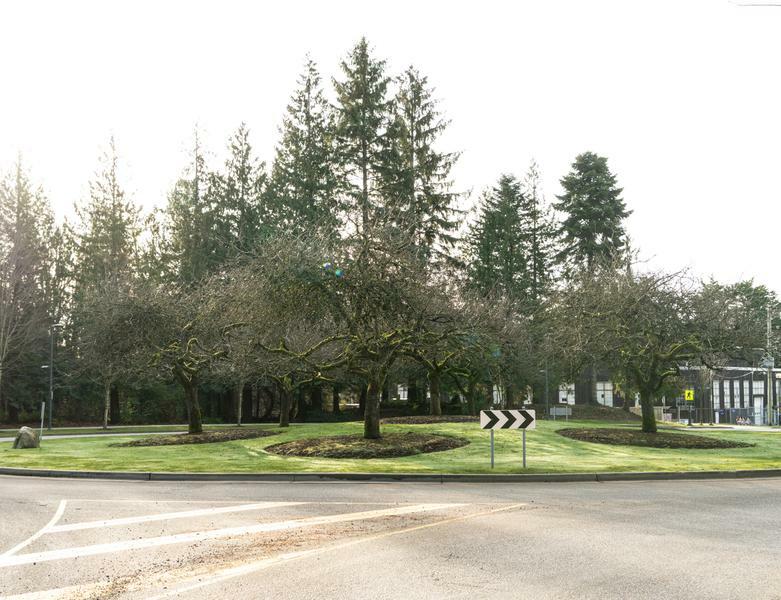 Pause, though, and you notice a circle of trees at the centre of the roundabout. These are some of Newton’s trees. The sextet have particular meaning to their owners at the TRIUMF Particle Accelerator Centre. Rooted just outside the research centre, the trees are a representation of their six-pronged logo, which draws its inspiration from the six magnetic sectors of their main particle accelerator. What’s more, the trees are a symbol of science overall — particularly for those within TRIUMF’s research team, including professor emeritus Dr. Jean-Michel Poutissou. But how did these famous trees get to campus? According to Atlas Obscura, pieces of the original tree have been distributed worldwide since a partial collapse of the original tree in 1816. Universities, gardens, research centres and observatories in various countries now hold a piece of its puzzle. Today, there are Newton trees on all continents except Antarctica. When it comes to universities, UBC isn’t the only one to house some of the original tree’s offspring. With seemingly no tradition or policy surrounding the distribution of its seeds, campuses worldwide have their own version of the trees including York University in Toronto and Newton’s alma mater, Cambridge University in the UK. Here at UBC, the quest to bring the trees to campus began with the first director of TRIUMF, Dr. John Warren. “He was a big apple grower [himself], he had a big orchard in the Okanagan. So you can see that connection, but he wanted a symbol that would symbolize fundamental research, so he planted the [trees] right in front of TRIUMF,” Poutissou explained. Discussions between TRIUMF and England’s National Physical Laboratory, which houses the trees, to bring some saplings of the tree to UBC began in the late ’60s. Because the internet didn’t exist then, all the work was done over telexes, a system of telegraphy with printed messages transmitted and received by teleprinters. In the UK, the National Trust are the caretakers of the original Newton tree, which is a varietal called the Flower of Kent. It took just under a year to get two saplings to campus. They arrived on January 4, 1971. With the development of the Wesbrook area in the mid-1990s, however, threats to the continued existence of the trees came to the forefront. Plans to change the roundabout to one, straight road would have been the end of the historical circle as it stands. A campaign to the president of the university stopped the area’s reconstruction, saving the shrubs and their current circular organization. Outside of that campaign against the removal of the roundabout, however, they rarely get any attention at all, according to Poutissou. Their only real moment in the spotlight since their planting was for TRIUMFs 40th anniversary ten years ago, when Warren’s wife visited the centre. For Poutissou, the closest similar symbol of scientific curiosity that came to mind was the blue whale in the Beaty Biodiversity Museum. Unlike that gigantic fossil, though, the trees are hidden in plain sight.